Alligator Plush Toys. 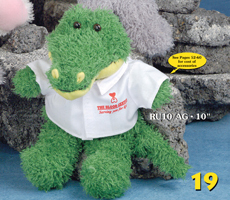 Personalized alligator plush toys with custom printed logo t-shirts. 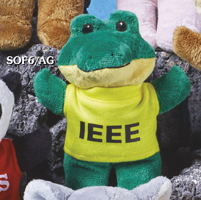 Personalized stuffed toy alligators with printed t-shirts featuring your logo. 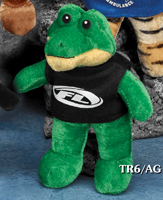 We offer many different sizes of alligator plush toys. All prices include the t-shirt color of your choice with a one-color imprint. Choose the personalized alligator you prefer. 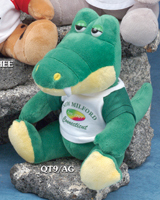 Personalized alligators with printed t-shirts are the second most popular animal in our line. Naturally, Teddy Bears are number one. 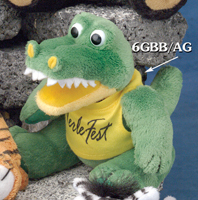 We offer 6 different sizes of custom alligator plush toys. Each alligator has a different expression and is a different size. 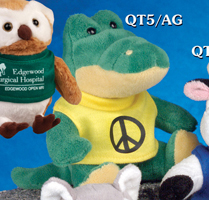 These customized plush toy alligators are great for promoting schools, sports fundraising, corporate events and promotional giveaways. 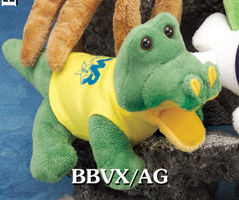 Our logo alligators are available with printed t-shirt, printed ribbon and many other accessories. The t-shirts are the most popular accessory. The catalog price on each page includes the t-shirt or similar accessory with a one-color imprint. If your logo is multi-colored, we can only print onto a white background as displayed above. 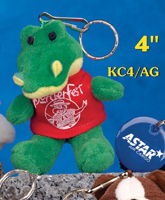 The set-up charge for custom alligator plush toys is $25.00. If you need a specific PMS colored imprint, please add $35 for PMS color matching. Artwork and inquiries should be submitted to Sales@TShirtBears.com.